The most important part of establishing your new lawn is keeping the turf moist during the establishment period – this is typically the first two weeks but that can depend on the weather conditions, your location and the time of the year. Keep a very close eye on the new lawn – it needs to remain moist at all times. This can mean watering up to four times a day in warmer conditions – early morning, mid or late morning, late afternoon and early evening. You don’t need to flood the new lawn – just keep the turf and the soil immediately below moist. 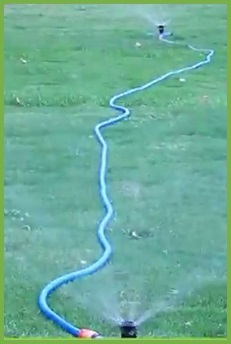 Be systematic and water all the lawn. If it is hot and/or windy, the new lawn can dry out very quickly and additional watering may be needed. How will you know? If the leaf blades start to shrivel, dry out or curl then the lawn needs a drink. Once your lawn sets root into the soil it is starting to become established. You can test for this by trying to gently lift a corner of a roll or slab, if it doesn’t lift easily then the roots have set into the soil. This means your lawn is growing well. If it lifts easily then it needs longer to set its roots. Once establishment is happening you can start to ease up on the watering depending on the weather and the climate in your region. The idea is to get to a point where you water less frequently but more deeply. This encourages deep root systems and ultimately a stronger and more drought tolerant lawn. As the water drains through the soil, the roots seek the water out deeper in the soil rather than just hanging around near the surface, which is what will happen if you just give short, regular waterings. Contact the team at Harden Park Lawns for your new turf and information on turf farm pickup and delivery options.